Get ready to feel as if you were taking a trip to go visit the big man up in the North Pole Santa Clause because this salt e liquid is going to give you a chilling sensation. Mint is the limited edition flavor that is being introduced to us by Air Factory Salts E Liquid. Just hearing the word “salt” makes the mouth of many people water because of the intense throat hit you are going to feel as the flavors begin to make their way down your throat. Before you can even encounter that, you will take your first pull and feel the minty sensation making its way in. The mint flavor is going to taste sweet and allow you to feel as if you were walking around with snow falling all over the place making you feel cool and refreshed. 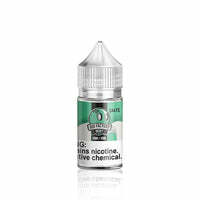 As the minty flavor begins to creep down your throat, you cannot help, but grow anxious because you know that when vaping with a vape juice containing salt based nicotine, the throat hit is going to be something out of this world. Once you feel that throat hit, you get the sensation as if you just swallowed several mints and do not know how to control the iciness taking over your body. You might even feel as if you just dove into a pile of snow. When it is time to begin to exhale, you start to feel the flavors smoothly making their way out of your throat. You will feel the aftermath of the throat hit, but nothing too crazy for you to freak out. The clouds are going to flow out of your mouth, but they are not going to be too big, but they will still be aromatic and convince you to go on another amazing cooling trip. Mint - Air Factory Salts E Liquid has a rating of 4.5 stars based on 2 reviews.